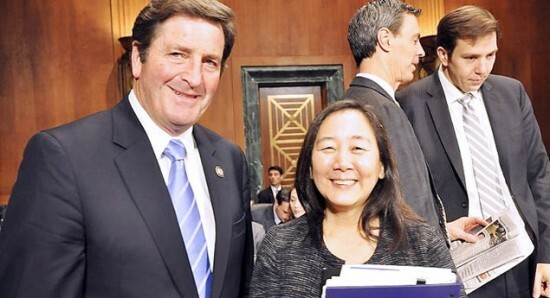 Rep. John Garamendi with Lorraine Bannai, director of the Korematsu Center for Law and Equality. WASHINGTON — The JACL is supporting the Due Process Guarantee Act, a response to the National Defense Authorization Act signed into law by President Obama at the end of last year. The NDAA contains provisions that may allow for indefinite military detention of any terrorist suspect apprehended on U.S. soil. Sen. Dianne Feinstein (D-Calif.) and Rep. John Garamendi (D-Walnut Creek) introduced the Due Process Guarantee Act, which protects the rights of American citizens and legal permanent residents. The JACL said that it appreciates this first step, but would like to see a bill protecting the rights of all people. On Feb. 29, Feinstein and the Senate Judiciary Committee held a hearing on the Due Process Guarantee Act. Judiciary Chairman Sen. Patrick Leahy (D-Vt.), Ranking Member Sen. Chuck Grassley (R-Iowa), and Sens. Mike Lee (R-Utah), Lindsey Graham (R-S.C.) and Al Franken (D-Minn.) were all present. The hearing’s panel of experts included Reps. Garamendi and Jeff Landry (R-La. ), Professor Stephen Vladeck of American University’s Washington College of Law and Steven G. Bradbury, former acting assistant attorney general of the U.S. Department of Justice. Professor Lorraine Bannai, director of the Korematsu Center for Law and Equality at Seattle University School of Law and a member of the legal team that reopened Korematsu v. United States, also gave testimony. She drew upon the experiences of the Japanese American community during World War II as an example of the dangers of suspending basic rights. In an op-ed piece in the Chronicle last December, Feinstein wrote, “When I was a child, my father took me to the Tanforan Racetrack near San Francisco. The track was a ‘civilian assembly center,’ a staging point for detainees en route to more permanent ‘relocation centers’ in rural California, Arizona and Utah. “Experiences over the last decade prove the country is safer now than before the 9/11 attacks. Terrorists are behind bars, dangerous plots have been thwarted. The system is working.